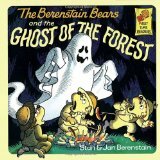 The Berenstain Bears and the Ghost of the Forest tells how Papa Bear meant to scare the Bear Scouts on their trip to the forest, but ended up receiving a fright himself, courtesy of Mama Bear. This is another Berenstain Bears book with a decent story, which kind seem to grow increasingly uncommon as the years wore on. This time, there’s a story in support of a lesson, rather than a story as an excuse for a lesson. And the lesson is a fine one for kids, as well. Of ghosts, it says “There are no such things!/There never have been!”, but “it’s fun to be scared/of them anyway!” And, a little more subtly, treat others as you would be treated–if Papa wants to scare them, he should be prepared to be scared himself. The art is fairly good in this one. We get to see Papa making his disguise, the Scouts preparing their camp, and the title illustration is nice, too. Actually, I haven’t mentioned this before, but the title page illustrations are usually quite good, even when the story or the other art is not. I’m not too sure that this book will keep kids from being scared of ghosts, but it’s still a pretty good Berenstain Bears book. This one doesn’t seem to be available for the Kindle, but there are always plenty of paper copies, so pick one up if it interests you. This entry was posted on July 18, 2011 at 3:47 pm	and is filed under Book, Review. Tagged: children's book, picture book, Stan & Jan Berenstain, toreview. You can follow any responses to this entry through the RSS 2.0 feed. You can leave a response, or trackback from your own site.